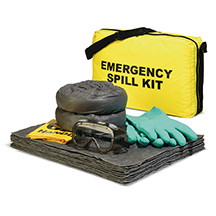 Once a spill is contained, it's time for sorbents such as PomPoms, Net Bags and Sweeps. 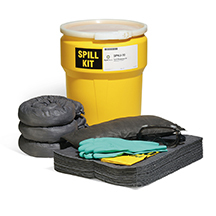 These products are used on the surface to absorb spills and surface sheen. For oil only - they'll absorb the oil but won't become weighed down with water. PomPoms float on the water's surface to absorb oily spills and even surface sheen. Thousands of thin strands of polypropylene are joined together to create this high surface area sorbent. Heavy oils adhere to the PomPoms, while water is repelled, so they won't become weighed down and capacity won't be wasted. This means you can leave them in place longer for maximum effectiveness. Individually packed to let you configure PomPoms to best suit your application. PomPoms float on the water's surface to absorb oily spills and even surface sheen. Thousands of thin strands of polypropylene are joined together to create this high surface area sorbent. Heavy oils adhere to the PomPoms, while water is repelled, so they won't become weighed down and capacity won't be wasted. This means you can leave them in place longer for maximum effectiveness. PomPoms come connected on a rope for instant deployment. Net Bags float on the water's surface to absorb oily spills and even surface sheen. Loose poly blend encased in a nylon mesh bag absorbs large amounts of petroleum-based liquid. Just toss Bags on a contained spill — heavy oils will adhere, while water is repelled, so Bags won't become weighed down and capacity won't be wasted. This means you can leave them in place longer for maximum effectiveness. White color designates Oil-Only sorbency and makes it easy to identify when Bag is saturated.